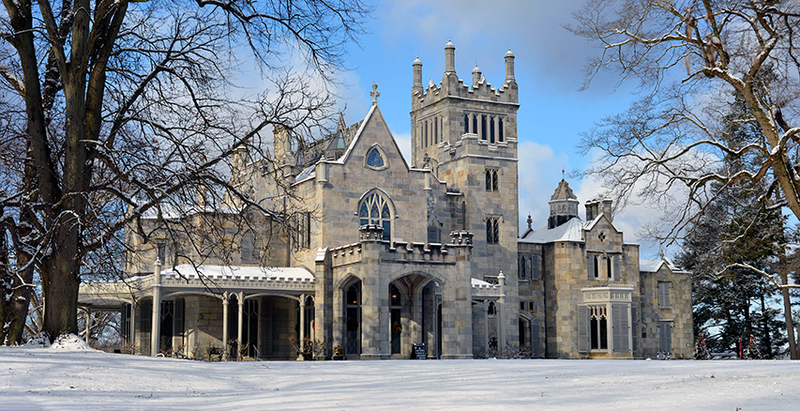 With easy access from the Old Croton Aqueduct Trail, Lyndhurst estate has a spectacular Gothic Revival Mansion (admission fee) and seasonal rose garden overlooking the Hudson River in Tarrytown, New York. Designed in 1838 by Alexander Jackson Davis, its architectural brilliance is complemented by the park-like landscape of the estate and a comprehensive collection of original decorative arts. Its noteworthy occupants included: former New York City mayor William Paulding, merchant George Merritt, and railroad tycoon Jay Gould. At the foot of the Lyndhurst Estate is access to a newly-opened section of the Hudson Riverwalk, with scenic views of the Hudson, the new Mario Cuomo Bridge, waterfalls and interpretive signage. Lyndhurst is about 3.5 miles north of the Keeper's House in Dobbs Ferry on the trail and about 1.6 miles north of the Irvington MTA station.